Newton, NJ – July 20, 2018 – Thorlabs has announced a new addition to its line of Compact Scientific Cameras with the release of 5 Megapixel CMOS cameras. Combining a high pixel count [2448(H) x 2048(V)] and a peak quantum efficiency of 79% at 600 nm with less than 2.5e- of RMS read noise, the CS505 series of cameras is ideally suited for scientific imaging applications. These cameras are available with either a monochrome or color sensor and can generate full-frame 5 MP readout at 35 fps with 12 Bit resolution. Measuring just 2.38” (at its widest point) x 2.78”, the compact camera housing has been engineered to provide passive thermal management for the sensor, reducing dark current without the need for a cooling fan or thermoelectric cooler. Thorlabs’ line of Compact Scientific Cameras integrate a comprehensive software suite that includes ThorCam (a Windows GUI) as well as support for third-party applications such as ImageJ/Micromanager, LabVIEW®, MatLab®, and a developer-friendly SDK. A USB 3.0 interface provides compatibility with most computers. The small form factor of the compact scientific series is feature rich, enabling seamless integration into a multitude of setups. An adjustable C-Mount adapter is factory installed into the SM1-threaded optical aperture of the camera for out-of the-box compatibility with industry-standard microscopes and camera lenses. Various mounting taps are also provided for optical post and 30 mm cage system compatibility. Suggested applications include fluorescence and brightfield microscopy, machine vision, and materials inspection. 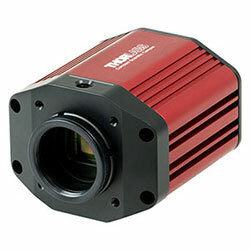 To see our full line of Scientific Cameras, please visit thorlabs.com. About Thorlabs: Thorlabs, a vertically integrated photonics products manufacturer, was founded in 1989 to serve the laser and electro-optics research market. As that market has spawned a multitude of technical innovations, Thorlabs has extended its core competencies in an effort to play an ever increasing role serving the Photonics Industry at the research end, as well as the industrial, life science, medical, and defense segments. The organization’s highly integrated and diverse manufacturing assets include semiconductor fabrication of laser diodes, optical amplifiers, lithium niobate modulators, quantum cascade/interband cascade lasers, and VCSEL lasers; fiber towers for drawing both silica and fluoride glass optical; MBE/MOCVD epitaxial wafer growth reactors; extensive glass and metal fabrication facilities; advanced thin film deposition capabilities; and optomechanical and optoelectronic shops.